Oub Kham Museum was another of those sites where we moaned about the admission price but came out thoroughly glad we paid. 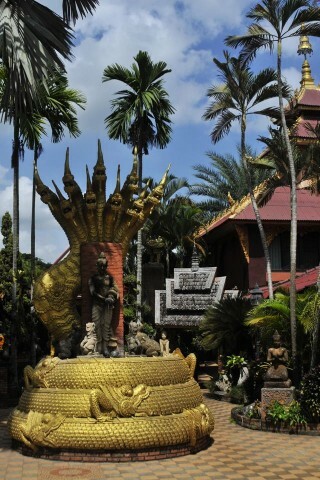 Browse places to stay in Chiang Rai on Booking.com. Book Now - Pay Only When You Stay. An amazing and priceless display; beautifully presented in a spectacular setting. Seeing we had a particular interest in Southeast Asian ethnology the museum curator, Julasak Suriyachai, gave us a personal guided tour – especially interesting since he is a direct descendant of the Shan royal family of Kengtung in Burma. His extensive and remarkable collection, and the museum that houses it, are a labour of love and he was nearly in tears as he bemoaned the fact that only foreigners visit his museum and young Thais have no interest in their history or heritage anymore. Exhibits include royal regalia of various former independent northern kingdom such a Chiang Saen, Nan, Phayao and so-on though – obviously through family connections - a bulk of the material is from Shan State. The museum’s prize piece being the spectacular gold throne of the lords of Kengtung which was somehow rescued before the Burmese destroyed the old royal palace in Kengtung. The exhibitions are displayed in a series of small buildings set in equally beautifully maintained and laid out gardens and courtyards. Sadly we can’t show you any of this as photography is strictly prohibited and since, (especially with no flash), we’re not convinced it would damage the exhibits. You’ll just have to go and see yourself. To reach the museum, head west down the continuation of Thanalai Road for a couple of kilometres until you see a major intersection with traffic lights. On the right should be Nakai, or Nakai Mengrai Road. A tuk-tuk will set you back 100-120 baht from the centre.